Screams, groans, engines and storms…the Epocylipse is rarely quiet. And when it is, you’d best be searching the shadows. But not every sound is a precursor to pain or a mark of hardship. Thanks to the music of the Harbingers, there’s a sure sign of life–real, thriving, hopeful life–in the AfterFall. Razor Edge Games would like to introduce you to the first member of the rhythmic Harbingers, Govind Ezra. Every wasteland adventure needs a driving, colorful soundtrack, and any epic score would be woefully incomplete without an energetic rhythm section. Setting the tempo for the band and keeping everyone on their toes with his drums, Govind kicks things off with a checkered past and wild style all his own. 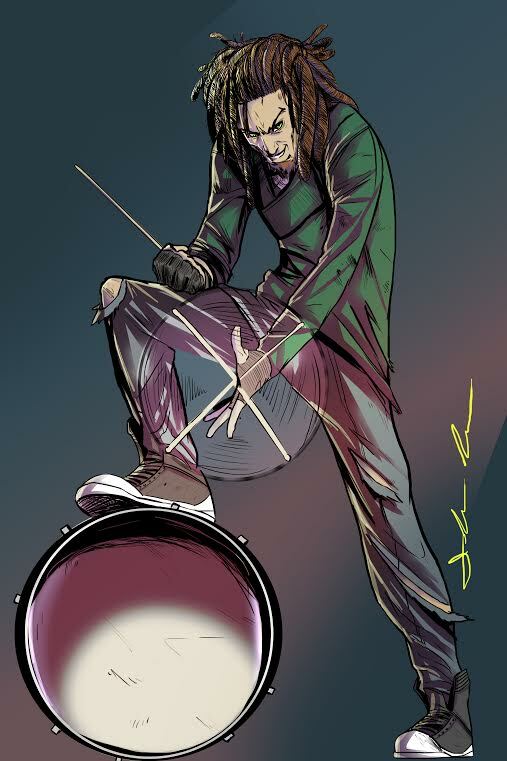 This chaotic drummer hails from the Steppe Tribes, but even the wise tribe elders couldn’t tame his spirit. He instead cut his teeth with the mysterious and deadly Shadow Walkers, and to this day can wield knives just as effectively as his drumsticks. Govind has since found a new family in the Jug Band, but he hasn’t forgotten his roots. He brings the lessons he’s learned over the pandemonium of his life to his music and a fiery start to the band! Adding to the immersive world of Eden Falling, the unique sounds of the Harbingers will captivate players. The vibrant personalities of the members will inspire and add a unique touch to the gaming experience.